The holidays are quickly upon us. As the autumn days grow shorter and cooler, shoppers are increasingly out and about, looking for the perfect holiday gifts for friends and loved ones. That’s why it’s so important to start planning your holiday window displays and holiday merchandising now. An exciting window display will draw shoppers into your store, and cute and whimsical merchandising throughout the store will engage customers to stay a little longer while searching for the perfect gift. Even small retailers with limited budgets can create inexpensive eye-catching displays with these tips and tricks! You can pull together a modern, funky display like this using items you probably already have around the store. Simply tie colorful strings of mostly equal length to ornaments in a few select holiday colors, like silvers, golds, and reds, or varying shades of green, as pictured. Then, tie strings in a circle around the display rack to create a hip Christmas tree. TIP: Just like on a real Christmas tree, put the bigger, heavier baubles towards the bottom of your ornament tree. The smaller ones will look great higher up. If you need a few more ornaments to fill out your tree, login to www.tagltd.com or check your fall/holiday print catalog. All you need for this holiday merchandising idea is paper, scissors, and string. It doesn’t get much simpler (or inexpensive) than that. There’s something really charming about simple paper snowflakes… maybe it’s because they bring back memories of making these during childhood. Either way, this great holiday decor idea is sure to fill your guests with a sense of simple wonder right as they enter the store. If you don’t already know how to make paper snowflakes, Martha Stewart has an easy how-to, complete with photos. You can also search online to find printable patterns, or take a look at Pinterest for inspiration. If you don’t have enough time to make dozens of paper snowflakes yourself, have employees give you a hand. Making snowflakes can be a fun activity to do during slow retail hours. 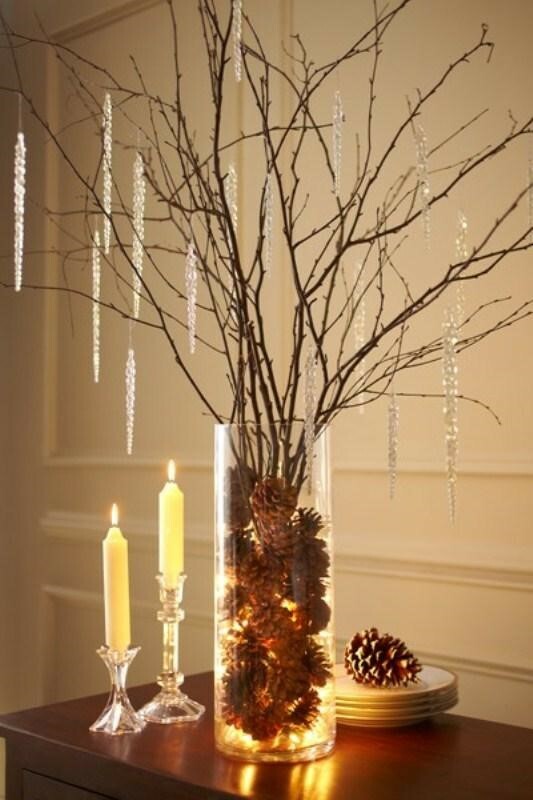 Create a rustic, charming holiday display with a simple branch and some votive candle holders. Grab a branch from outside, trim off any dangerous or unsightly areas, and hang the branch from the ceiling with rope. Then, simply hang your favorite votive candle holders to fill your store with the warm nostalgic glow of candlelight that is perfect for evoking the holiday spirit. Branches are also a great way to display ornaments. This holiday merchandising idea is not only beautiful, it’s functional. Branches are a unique way to showcase the assortment of ornaments you have for sale in your store. Place a small branch inside a tag hurricane or vase filled with seasonal items such as pine cones and cover the branch with ornaments for an impactful look. If you really want to grab a customer’s attention, consider using twinkle lights to create a beautiful holiday glow to draw their attention to your display. TIP: Flameless, LED-lit branches are an excellent alternative to natural branches. Not all your holiday shoppers will be Christmas shoppers, and if you’re looking for merchandising ideas for your Chanukah products, consider creating this simple and elegant centerpiece. Just fill a tag hurricane with chocolate gelt and top off the look with a bunch of white flowers (either real or faux). Then, place the look at the center of your Chanukah items to visually cue your customer’s into the fact that you carry gifts and decor for a variety of holidays. With these five simple tips, you can achieve your holiday merchandising goals on a small retailer budget, proving that you don’t need a large department store budget to draw customers into your store and engage them will your holiday gifts and decor. Retailers: to shop tag products, login to tag's wholesaler site, talk to your rep, or check your fall/holiday print catalog. New customers can reach us directly at NewAccounts@tagltd.com, Monday - Friday 8am - 5pm CST. Consumers: non-retail customers can shop great tag seasonal and everyday products on our retail site, tag2u.com. What do you think? Do you have a comment or question? We'd love to know if you have your own holiday store merchandising tips, pictures, and ideas! Oct 10 throw a frightfully awesome halloween party!